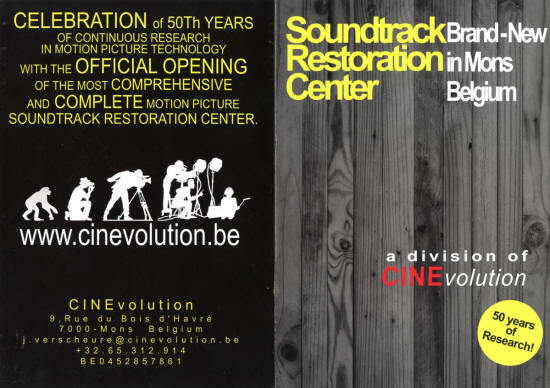 The Sound Restoration Centre of Excellence - Soundtrack Restoration Center, Mons, Belgium. 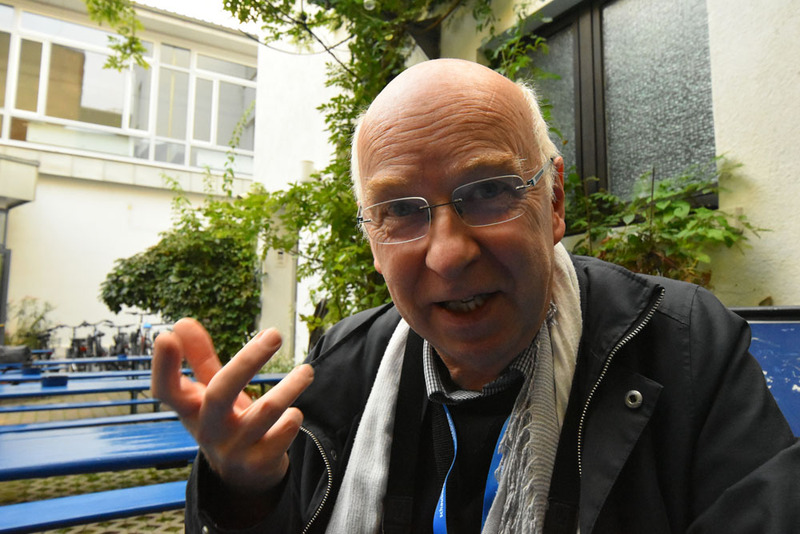 Jean-Pierre Verscheure, the man behind Cinevolution, the Centre of Excellence in Sound Restoration, as photographed in Karlsruhe, 2017. In October 2017, I met Mr. Jean-Pierre Verscheure (65) once again, 21 years after our first meeting in May 1996. Our first meeting had been at his home in Mons in Belgium for an informal dinner, and demonstration of his home theatre set-up. At Jean-Pierre's house I heard SENSURROUND for the first time in nearly 20 years, original 35mm 4-track magnetic sound, and saw his vintage Vitaphone playback system. Jean-Pierre was an avid collector of sound systems, and had every Dolby processor imaginable in his perfectly organized projection room. Jean-Pierre has remained a good friend and an inspiration to me, and we stayed in touch on and off ever since. 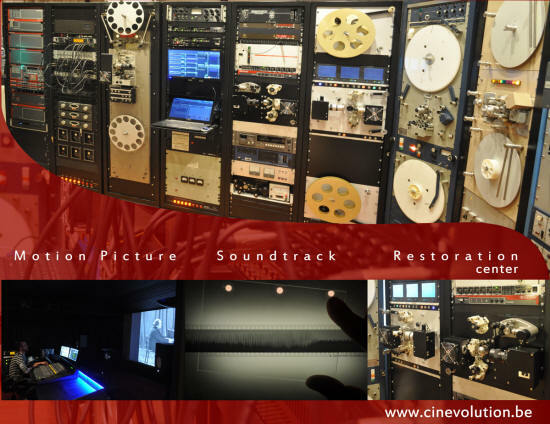 When we finally got together again, I asked him some questions about the work his company Centre of Excellence in Sound Restoration does, about his work in general and specifically about the remastered MCS 70 "Flying Clipper" BluRay. We were outside in the courtyard enjoying a glass of wine, between two films at the Schauburg cinema, in Karlsruhe when this conversation took place. Jean-Pierre Verscheure: No exaggeration, it was unusual and when you started your "fight" [for 70mm], I thought you were crazy, because it was surely impossible to find so much information about the 70mm format. I had attempted a shot at it, and had collected 200 to 300 paper pages. You started a [web]site and I thought you were crazy, because there cannot be that much information available. Your site is now unbelievably big. It is one the most beautiful sites I have ever seen in my life! Congratulations! Many people say that it was unexpected and unbelievable. You gave me the inspiration to bring 70mm into my home. Thomas Hauerslev: Thank you. 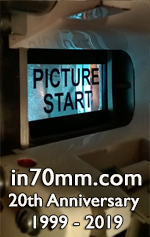 Let's talk about 70mm, and what you have done in your professional career and where you are now? JPV: Aha! That is a very big question[s]. I was a teacher of Cinematography in Brussels in the School of Cinema and Technology. I lectured in the Evolution of Technology in Image and Sound. I do the same as you, but in the capacity of teacher. I lecture my students on the subject of image in the cinema, the depth of field in CinemaScope, for example, and I lecture on the subject of sound. What is Academy Sound? What is Dolby A? What, in fact is Dolby Digital? Almost a hundred different sound systems were introduced into the motion picture industry from "The Jazz Singer" in 1927 to today in that evolutionary process. At the same time, I give lectures all over the world. One day, I was asked by a film archive about whether I could invest in sound restoration, having lectured in the history of sound in cinema [at their archive]. I would therefore be able to restore old sound systems. 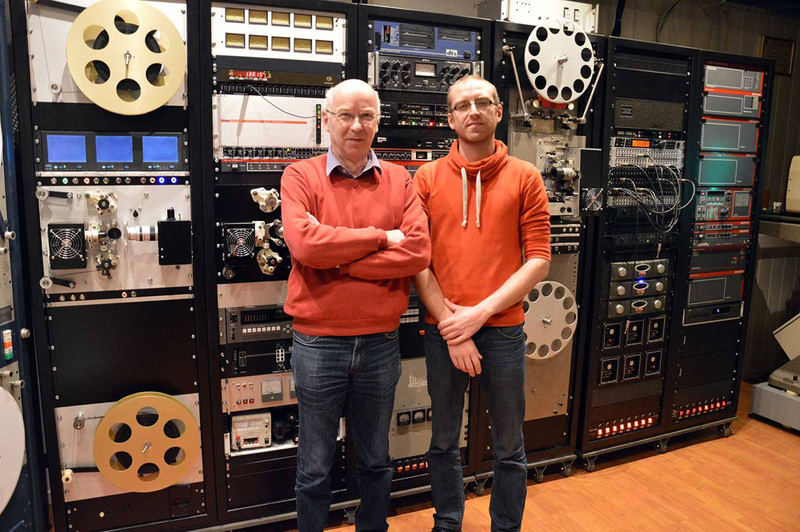 Four years ago, I decided to go into partnership with my son [Laurent Verscheure], who is a sound engineer, in order to create a Centre of Excellence in Sound Restoration. It is very complicated! It involves assembling a collection of sound readers, which need to be capable of reading a great variety of sound systems. We need to transfer the analogue sound to digital. My son is a specialist in digital techniques and I am a specialist in analogue sound, which is why we needed to collaborate. 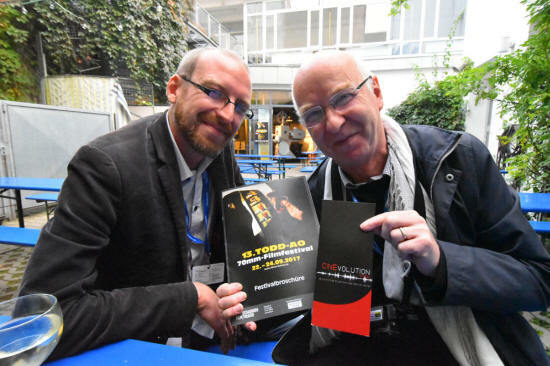 Jean-Pierre Verscheure and Laurent Verscheure in front of the technical installation of Cinevolution in Belgium. Picture from Facebook. In addition to a comprehensive collection of sound equipment, I have devoted my life to the study of the evolution of optical sound and all the Academy Curves. Everyone thinks they know about the Academy Curve, but there are so many different types of the Academy Curve. There are many different types of cinema loudspeakers, with differing characteristics. These are very complex matters. It was my main task and so it was comparatively easy for me to research into the reasons why there are so many different types of Academy Curve. Each time the quality of sound coming from a loudspeaker was improved, the Academy in Los Angeles needed to modify the Curve. There were approximately 20 evolutionary stages. You need to know that there are 20 different Academy systems in order to determine the characteristics of the many curves. In our studio, we have specialist equipment. If you ask me to reproduce a sound recorded in 1952, I reproduce the sound with the Academy Curve of that precise time. We installed an appropriate loudspeaker of that period behind the screen and so the correct sound was heard. That is our philosophy. Having so many sound systems, we listen to the original sound, before we take a final decision for the restoration. What is the original sound? For example "Flying Clipper" was first released in 1962. What was the equipment in use in all the studios of the world in 1962? Each studio then used an Altec Voice of the Theatre System. What was the characteristic of this specific model? We have that knowledge, because I worked for Altec for two years. I have all the specifications, and there are a lot! Thus we are able, in our small auditorium, to reproduce a sound exactly like the sound that was heard in 1962! It is a reference. We also have the magnetic dubber of that time. It is Todd-AO. I was in Los Angeles many years ago and I recognised a Westrex six track reproducer in the studio. I have the very same equipment. Herbert Born [of the Schauburg Cinerama, ed] asked me to read the sound. We had not only the same Westrex reproducer, we knew the precise characteristic of the recording, the characteristic of the reproducing curve. We now had the sound exactly as it was in 1962! We had the exact reference. That is our philosophy! We improved the system. We possessed the last generation of magnetic sound head. Herbert researched, and you did too! We have the same approach. What is the best possible way to pick up the film sound track? We needed, and had at our disposal, the very best magnetic heads of the most recent generation. We have very good relations with Dolby Laboratories. We have the last magnetic pre-amplifier dedicated to reproducing the sound in the best possible way. And lastly, we transfer off the old analogue standard to the modern DCP. That is the responsibility of my son. We carefully transfer the old standard to the new standard. We believe that is the best way to preserve our history - without compromise. DP70 and sound dubbers at Cinevolution in Belgium. THa: You mentioned that you had 200 rolls of sound film. How did you approach the sound restoration of "Flying Clipper"? How did you approach a job like that? I imagine that the studios have a lot of archives of rolls of film of "Flying Clipper". They ship everything to you and they have no idea what's in the can, correct? JPV: My approach to sound restoration, was to be capable of restoring every kind of sound. To restore 35mm optical negative sound in many diverse standards, because it was my field - the history of sound was my passion, and I was familiar with a lot of different systems. When the archive sent us 200 reels, there were many different sound systems and standards. For example there was optical negative sound. We have a special reader. My son knows the techniques involved in reading optical negatives. My son is not only a Sound Engineer in Digital Techniques, but he also works in film laboratories. He is very well versed in the reproductive characteristics of a sound negative. It is very specific. The work is a collaboration between my son and I. 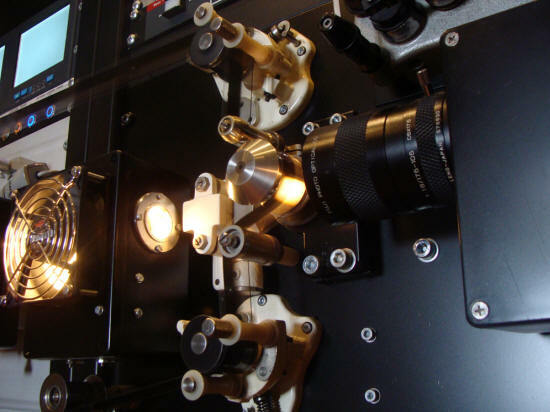 We have a very high definition optical sound reproducer and I invite you to see the kind of equipment involved in Mons [Belgium]. So it was a problem that we solved. On the other hand we had a lot of magnetic film. JPV: Yes, many reels were in a very bad condition - the vinegar syndrome, That was the first of the problems. Some prints had six tracks. Japanese prints. American prints. Other prints were in four track. There are more than twenty different magnetic characteristics and sometimes, some countries had their own unique recording and reproduction characteristics. In France, for instance, the sound is not recorded to the same standard as in the US. I needed to be aware of that beforehand. 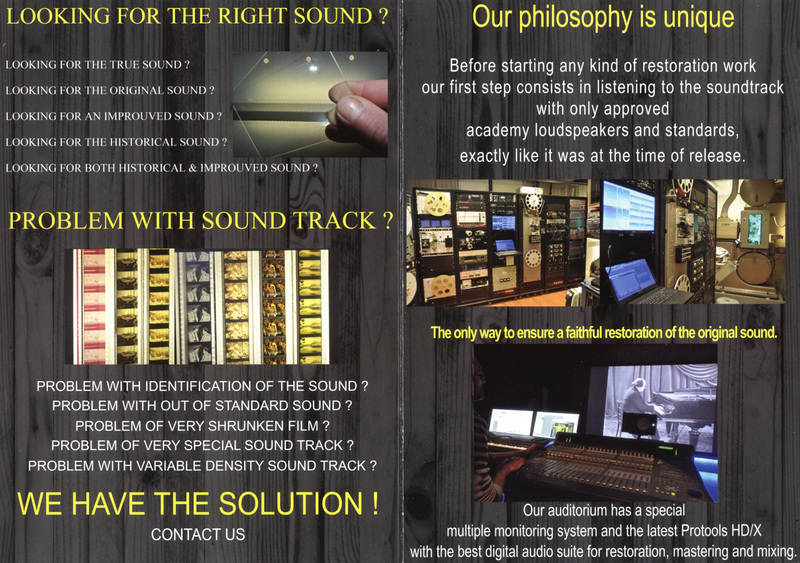 It is not easy to establish a Sound Restoration Centre of Excellence. We need to know exactly what we are doing. We have four track magnetic sound - Master Sound. We have a four track master, made specifically for CinemaScope four track positive prints, with particular characteristics. For example, with the twelve kHz sound track, which controls the surround for the cinema levels. We need to adapt it to the Todd-AO industry standard. We have a special four track CinemaScope master, but not made for Todd-AO sound. We needed to have a very precise approach to adapt it. From these vast quantities of reels we must identify each kind of sound. It was a lot of hard work! Unbelievable! THa: The soundtrack that you got, was it projection print sound or was it studio master tape? JPV: It was the master for the projection print. Note, it is not Todd-AO sound. So we need to adapt it to Todd-AO standard. Because we know the characteristics, therefore we can adapt. It is not an insoluble problem for us, but many people do not understand what I am talking about. But it is my job. 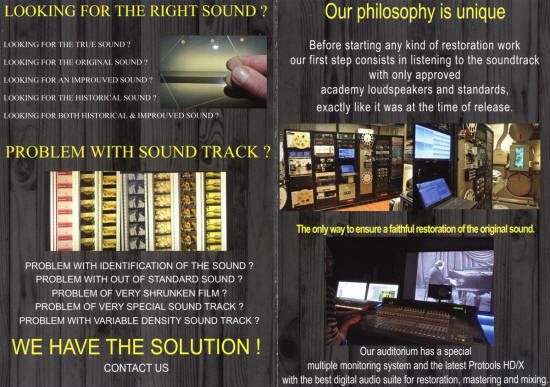 When we decided to establish The Sound Restoration Centre of Excellence, it was necessary to have complete mastery of the evolution of all the different sound standards. We have a fantastic collection of test films in 4-track CinemaScope and our approach is high precision. It's nice to watch a film, but the restoration part of it is very difficult and serious work. What is the specific standard in this particular country at this particular time? Jean-Pierre Verscheure and Laurent Verscheure in Karlsruhe, 2017. THa: What kind of clients do you have? Where do they come from? You have done a massive amount of work on "Flying Clipper". What other projects? JPV: We have clients from Germany. We have the film archives of Paris and Brussels. We work for Technicolor, which is fantastic for us, because Technicolor commissioned us to restore the 4-track CinemaScope system. These days, that is a very tall order, so Technicolor approached us. We work for clients on the other side of the world, for clients in Switzerland, for independent producers in France and in Belgium. We began four years ago. We needed all of four years to create The Sound Restoration Centre of Excellence. To begin with, it involved 50 years of comprehensive research. We officially inaugurated The Sound Restoration Centre of Excellence, a year ago. Throughout that year we established many contacts in the field of film archives. THa: How many people work there? Just you and your son? JPV: Yes, only us! Because we initiated these activities ourselves. Now we are nearing the restoration of fifty films. THa: What else have you done in addition to "Flying Clipper". Are you working on several projects at the same time? JPV: No, we made a lot of restorations for Technicolor. Short films in 4-track stereo. For Belgium, we made restorations of famous Belgian films like "DAENS", directed by Stijn Coninx. It is the most important Belgian film in the film archives in Brussels. THa: What is it that excites you so much about cinema sound? Clearly you are passionate. You have been working in cinema sound for many years and you know everything there is to know about it. What is it that really excites you about it? JPV: In 1992 I decided to construct a special sound system, fully capable of restoring sound in real time. In 1992 there was no digital cinema projection. It was completely unknown in film theatres. For film archives, it was quite impossible to restore all their film collections. It was simply too expensive. The situation today is completely different. At that time, it was quite impossible to restore all the films in all the film archives, in all the world. So I endeavoured to find a solution, a practical means of restoring sound in real time, as the film is projected in the film archive. I created a special system called Scantrack. I have the prototype in my home. At last, it was possible to restore sound in real time. Imagine! In 1992! So the challenge was how to restore sound? Old prints can be very noisy and crackly. I made a special sound reproducer. If a film archive screens a very old print of good quality, we have the right equipment for the task. That was the beginning of The Sound Restoration Centre of Excellence. Think about it, a dedicated sound reader capable of restoring all soundtracks in real time. The results were unbelievable! 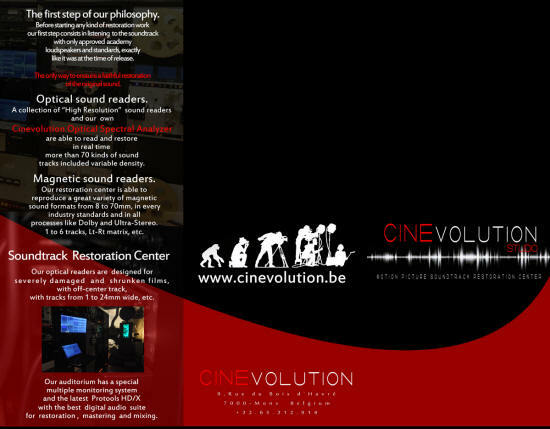 35mm film sound reader at Cinevolution in Belgium. I collaborated with The University of Brussels, and with Chace in Los Angeles. It was very engrossing. I worked with John Moseley, who created COLORTEK and many other sound systems. There were collaborative projects going on between many people. But soundtrack was my project. It was the result of intense research. It was the starting point of The Sound Restoration Centre of Excellence many years later. I was fascinated by the quality of sound in film theatres. The true beginning of my interest, was "My Fair Lady", which I saw, when I was a kid. I actually started research into television. My original profession was as an engineer in video technology. I was 22 years old when I started to study TV technologies. Then I saw "My Fair Lady" in 70mm and heard it in six track stereo in Brussels. The picture was so beautiful, the sound was so clear, so nice. I forgot television. I began my interest in sound. The sound was so beautiful. I went into the projection room and saw the equipment and I decided to study the history of sound in motion pictures. Why is the sound so beautiful in some theatres and not in others? Now I have the answer. That was the beginning of my interest. I was also fascinated by the stereophonic sound in "My Fair Lady". It was true five channel sound, truly beautiful! The dynamic range! So I went home and forgot about television and continued to research into picture and sound technology. It was very vital and important, because when you make this kind of research, you are alone. Very few were interested in my work. Now, you came along and you were interested in CinemaScope 55. You took a lot of photos and you expressed an interest in my production work. For me it was something new. At long last! Someone is interested in the history of sound in motion pictures. You did a lot of valuable research. 70mm is simply a matter of aspect ratio and projection at 30 frames per second. Not so! You went further and further and further, all the time. For me that was what was so interesting! Your approach was to stimulate. I was no longer alone. You do it and you do it so well and you make 70mm so fascinating. When you saw my posts on Facebook, your reaction was so intense! So many questions! What kind of amplifier? Your response was marvellous! The most important thing is to preserve our precious history. You do that! 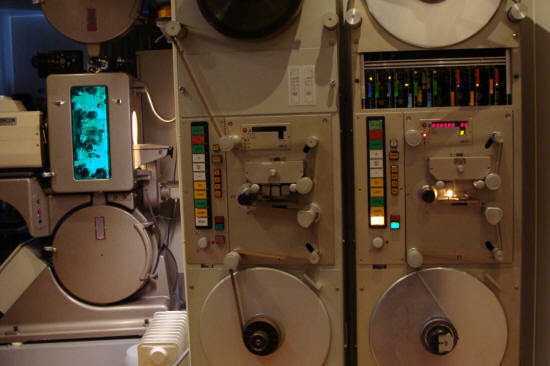 Preserve the history of 70mm film! The sheer pleasure and joy of seeing a movie when the projection is of the very highest quality, when the imagery on screen is closest to the intentions of the director. When we see a film, "My Fair Lady" or "Grand Prix" or "Baraka", when we see the film exactly as the director intends, that is the ultimate delight. You see it in the projection room, you see it in the auditorium. You see precisely what the director wants you to see. That's important! That's what I love! The Movie, finally!